We all love him, his liar catching bell, his sofa, his guests and top of all his gossips and spilling the beans of celebrity truth! Not to forget the Bumper Hamper celebrity killing each other for! 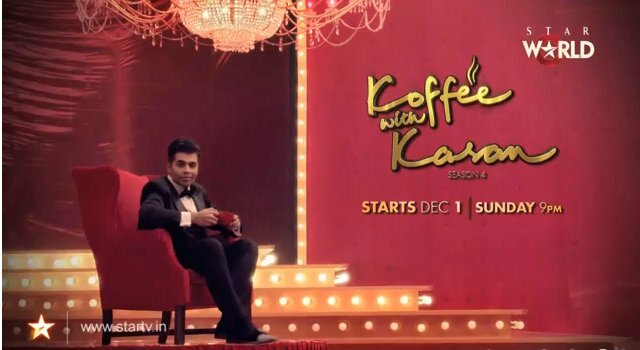 Koffee with Karan season 4 starts December 1st 9pm StarWorld. Our Karan is back with his new season of dhamak’s and this time it’s all Hollywood ishtyle. His musical video launched on 31st on Youtube by StarworldIndia is just superb. It says – Karan Johar makes his Broadway debut with this music video for Koffee With Karan season 4! This season, it’s Behind The Scenes, Beneath The Sheets! Now when the tag line is – “Behind The Scenes, Beneath The Sheets”, than it will surely give us goose bumps! Looking so forward to the start of the show. Opening of the show hope is not by SRK, rumours are Kapoor cousins will be the first one on the sofa. Kareena Kapoor Khan and Ranbir Kapoor.